Hostage negotiator Claire Michaels’ never thought she'd be involved in an international crisis. Can she overcome her scars of the past to stop a new al-Qaeda threat? Navy SEAL Rafe Kelly is on leave to recover from a knee injury he suffered during his tour in Afghanistan and he doesn't expect to be fighting terrorists on his home turf. When he's taken hostage, he knows he has to fight or die. I read this book as part audio and part Kindle book, though towards the end, it ended up being mostly audio as I found myself listening to it while playing computer games. It was very easy to just lose myself in a book while playing mindless computer games. It was a good evening, well spent. Anyway, the audio book is narrated by Simon Pringle-Wallace, and was actually done quite well once I got used to his voice. Since the majority of the characters were male, it was easier to get used to his voice once you get past his softer voice for Claire. Book-wise, even though I DID enjoy the book, it still seems, sort of, like I'm in the minority of opinions about it. While it was exciting, fast-paced, and enjoyable enough, there were still things about All Fall Down that didn't quite work out for me, mainly the events at the beginning. I haven't been able to really pinpoint why, but that some of the actions and events didn't seem to make much sense to me. Even so, having great characters helps the book. All Fall Down is bite-sized and flew by before I knew it. Once the action got started, everything just kind of fell into place. We already get to see a bunch of side characters, many of whom will probably be getting their own book. At the same time, the introduction of all these characters doesn't seem awkward or forced. And while I did like Claire and Rafe just fine, I felt like they were fairly standard as a main couple for a romance novel; though, to be clear, that doesn't take away from the fact that both are great characters. They just don't really stand out. 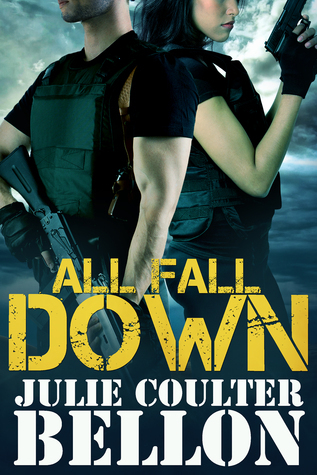 Very enjoyable, though not much more unique than any other romantic suspense outside of being about a hostage negotiation team, which is a premise I haven't come across in other romantic suspense books yet. HOWEVER, I have been introduced to this concept in an old Hong Kong television drama series, which I very much enjoyed, which is why I'd been drawn to the concept of All Fall Down in the first place. I will definitely find the time to continue this series.